The poems in Other Nations: An Animal Journal challenge the notion that animals are on this planet solely for humans to use and exploit. Instead, the poems recognize the individuality of each animal with the view that animals are, as the naturalist Henry Beston saw them, "other nations, caught with ourselves in the net of life and time, fellow prisoners of the splendor and travail of the earth." "Famà is a storyteller in the tradition of her forebears from Sicily, and was fortunate enough to hear firsthand the stories relating to the people and culture of that island country from her grandparents, great-grandparents,and countless other relatives. She also learned from them an appreciation of animals....This book, with animals as its characters, begins with a quote from Henry Beston, Naturalist, expressing that animals are neither brethren nor underlings, but 'other nations.' These inhabitants of other nations speak in a language we would not understand, except Famà translates it for us....This is a book of endearing poetry, imploring all who read it to look upon animals in a different light: to see, with Famà, that they are creatures with feelings, not to be mistreated. 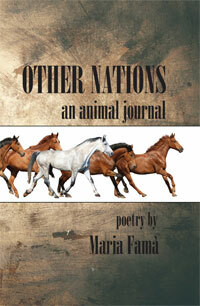 These poems are songs of praise, love, understanding, and compassion towards the creatures who comprise Other Nations." the hearts and souls of animals—feral and domesticated—that tame our human arrogance. of our connection to all beings, big and small, that share our planet with us. primordial seashells of past oceans; the lonely dolphin's aimless splashing around the pool; echoes a cricket's rush hour song in the humid August subway station, and in Maria Famà's kitchen. Humor, wit, poignancy—poetry lovers and lovers of animals will relish every poem in Other Nations.